Despite a barrage of snowstorms and nearby gas leaks this winter, LPMG Companies’ reNewbold project at 16th and Moore streets still has Fall 2014 in the crosshairs as a completion date, with the nine-home-construction Phase 1 beginning to wrap up this spring. The median-income-targeted housing development broke ground in October and is expected to be LEED Platinum certified – a four-tiered ranking system of environmental-friendliness by the U.S. Green Building Council, based on the standards of the U.S. Environmental Protection Agency. Platinum is the highest ranking possible, boasting 80 points or more on a 100-point meter. The reNewbold homes, if granted the certification, would be the first to be LEED-certified south of Washington Street. 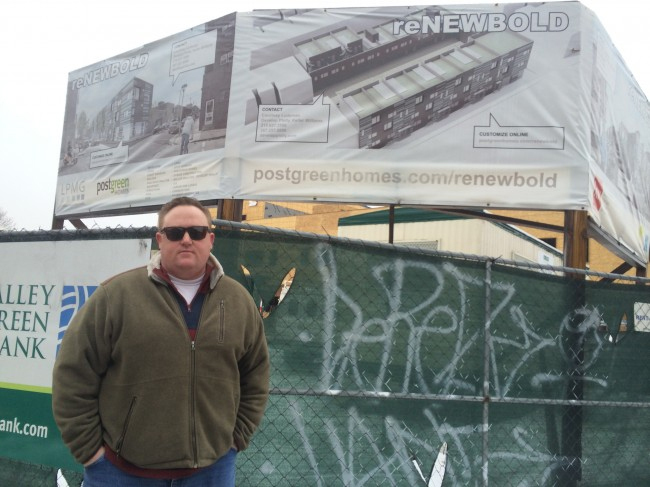 But designed as a money-maker or not, the reNewbold project continues to be touted as the largest private investment in Southwest Philadelphia in five decades – a fact John Longacre [LPMG Companies President] isn’t shy about making well-known.